Three U.S. groups are among those raided. Activists say the army is using the ruse of foreign intervention to stoke nationalism and deflect criticism of abuses. By Jeffrey Fleishman and Paul Richter, Los Angeles Times December 29, 2011 2:56 p.m. The move appeared to be part of a strategy to intimidate international organizations. The ruling military council has repeatedly blamed “foreign hands” for exploiting Egypt’s political and economic turmoil. But activists said the army was using the ruse of foreign intervention to stoke nationalism and deflect criticism of abuses. This entry was posted in Africa, Middle East, Military, US, World News and tagged David J. Kramer, Egypt, Freedom House, George W. Bush, Hillary Rodham Clinton, Hosni Mubarak, Mohamed ElBaradei, Nobel Peace Prize. Iranian authorities blocked a website Wednesday hours after it was launched by the U.S. State Department to be a “virtual embassy” reaching out to people in the Islamic Republic. “In accordance with the cybercrime law, access to this website is not possible,” read a notice to anyone inside Iran trying to visit iran.usembassy.gov. The “Virtual Embassy Tehran” website — which makes clear it does not offer consular services — is an attempt by Secretary of State Hillary Clinton to give Iranians a sympathetic view of the United States, which is referred to as “the Great Satan” by Tehran’s ruling elite. 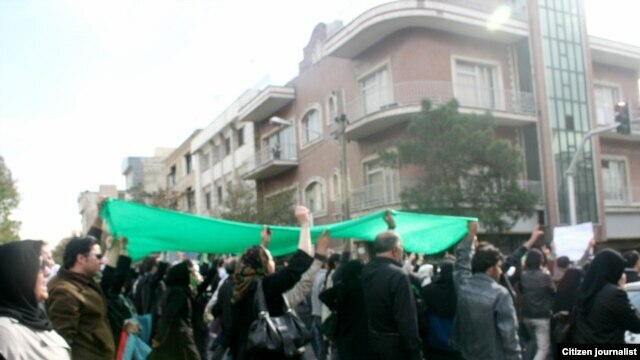 The White House condemned the effort by Tehran to control “what the Iranian people see and hear,” and said it remained committed to engaging in dialogue with the Iranian people. “Through this action, the Iranian government has once again demonstrated its commitment to build an electronic curtain of surveillance and censorship around its people,” it said. This entry was posted in Iran, Politics, Reports, Security, Technology, US, World News and tagged Great Satan, Hillary Rodham Clinton, Iran, Iranian peoples, Iranian Revolution, Tehran, United States, United States Department of State. 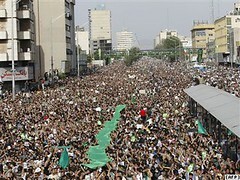 Opposition supporters in Tehran rally, despite an official ban, on the anniversary in 2009 of the storming of the U.S. Embassy in Tehran in 1979, when U.S.-Iranian ties were severed. The United States has launched what it’s billing as a “virtual Iranian embassy” in an effort to engage with that country more than three decades after the U.S. Embassy in Tehran was closed and diplomatic relations were cut with Iran. Direct contact between Americans and Iranians has been lacking since 1979, the year of Iran’s Islamic revolution and the taking of 52 American hostages at the U.S. Embassy in Tehran. Since then, the embassy — dubbed a “nest of spies” by Iranian revolutionaries — has been closed and Washington has relied on the Swiss government to represent its diplomatic interests in the country. This entry was posted in Iran, Politics, Reports, Security, US, World News and tagged Hillary Rodham Clinton, Iran, Iranian peoples, Iranian Revolution, Persian language, Tehran, United States, United States Department of State. 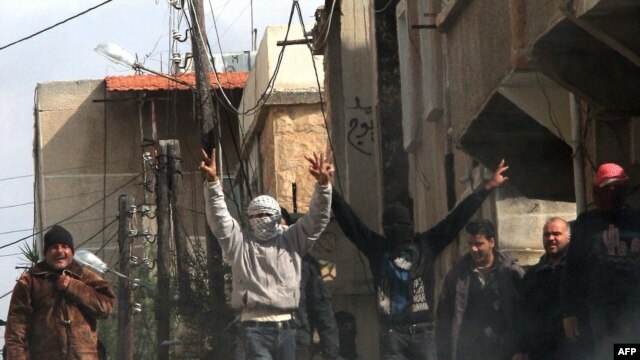 Antigovernment activists gesticulate as they gather on the streets of Deraa, Syria. ISTANBUL — Efforts to unite the Syrian opposition in their struggle against President Bashar al-Assad‘s regime are intensifying. 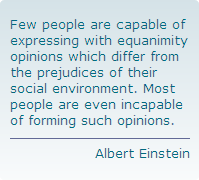 But for that to happen a number of political and ideological differences must be overcome.U.S. Secretary of State Hillary Clinton will get a firsthand view of the status of the Syrian opposition on December 6 in Geneva, where she will meet with a group of seven Syrian exiles to discuss the situation in their homeland. Among those assembled will be representatives of the Syrian National Council (SNC), an umbrella organization of Syrian opposition groups — most of them based outside Syria — that calls for direct international intervention and the creation of safe havens for the opposition. Noticeably absent will be representatives of the Damascus-based National Coordinating Committee (NCC), made up of opposition groups inside Syria itself and staunchly opposed to outside intervention or the use of violence against the Assad regime. Abdul Aziz al-Khair, a spokesman for the National Coordinating Committee, told RFE/RL that the group was approached by a British Foreign Office intermediary and invited to attend the meeting with Clinton, but declined the offer. Khair, who claimed he was “disappointed,” said only a formal invitation from the secretary of state would be acceptable. This entry was posted in Islam, Middle East, Politics, Reports, Security, Terrorism, War & Conflicts, World News and tagged Assad, Bashar al-Assad, Hillary Rodham Clinton, SNC, Syria, Syrian Air Force, United States, William Hague. MOSCOW (AP) — Firebombs have been thrown at a protest rally in downtown Moscow pitting demonstrators denouncing alleged vote fraud in parliamentary elections against hundreds of pro-Kremlin youths. An Associated Press reporter saw at least two firebombs thrown into a crowd of pro-Kremlin demonstrators gathered outside the Tchaikovsky Concert Hall on Tuesday night. It was not immediately clear who had thrown the incendiary devices or if they caused any injuries. Police moved in quickly on the gathering. The concert hall is adjacent to a square where anti-government protesters had earlier tried to gather, but were broken up by police. Moscow police spokesman Maxim Kolosvetov said about 250 people had been detained. MOSCOW (AP) – Police clashed Tuesday on a central Moscow square with demonstrators trying to hold a second day of protests against alleged vote fraud in Russia’s parliamentary elections. Hundreds of police had blocked off Triumphal Square on Tuesday evening, then began chasing about 100 demonstrators, seizing some and throwing them harshly into police vehicles. Pro-government United Russia supporters also rallied late Tuesday at Revolution Square near the Kremlin. State television footage showed a crowd appearing to number in the thousands. Prime Minister Vladimir Putin’s United Russia party saw a significant drop in support in Sunday’s election but it will still have a majority in parliament. Opponents say even that watered-down victory was due to massive vote fraud. Some Moscow demonstrators Tuesday shouted “Putin is a crook and a thief!” referring both to the alleged election fraud and to widespread complaints that United Russia is one of the prime reasons for Russia’s endemic corruption. Among the detained was Boris Nemtsov, a leader of the liberal opposition, along with prominent radical Eduard Limonov and Oleg Orlov, head of the renowned human rights group Memorial, the Interfax news agency reported. Large crowds also gathered on a square in St. Petersburg, visibly outnumbering police, a Danish election observer reported. Yet Sunday’s election results reflected public fatigue with Putin’s authoritarian streak and with official corruption in Russia, signaling that his return to the presidency in next March’s election may not be as trouble-free as he expected. Putin, meanwhile, called his party’s reduced number of seats in Sunday’s parliamentary election an “inevitable” result of voters always being dissatisfied with the party in power. Putin also dismissed allegations of corruption among his United Russia party members, calling it a “cliche” that the party had to fight. This entry was posted in Europe, Politics, Reports, Russia, Security, US, World News and tagged Hillary Rodham Clinton, Moscow, Putin, Russia, United Russia, Vladimir Putin. 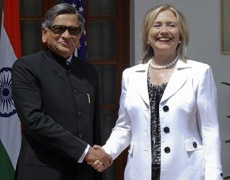 U.S. Secretary of State Hillary Clinton, in India for the second round of the U.S.-India Strategic dialogue, discussed a laundry list of issues, from defense, trade, and civil nuclear cooperation, to women’s empowerment, education, and innovation. This entry was posted in Asia, Intelligence, Reports, Security, Terrorism, World News and tagged David Rothkopf, Hillary Rodham Clinton, India, Manmohan Singh, New Delhi, Osama bin Laden, Pakistan, United States.